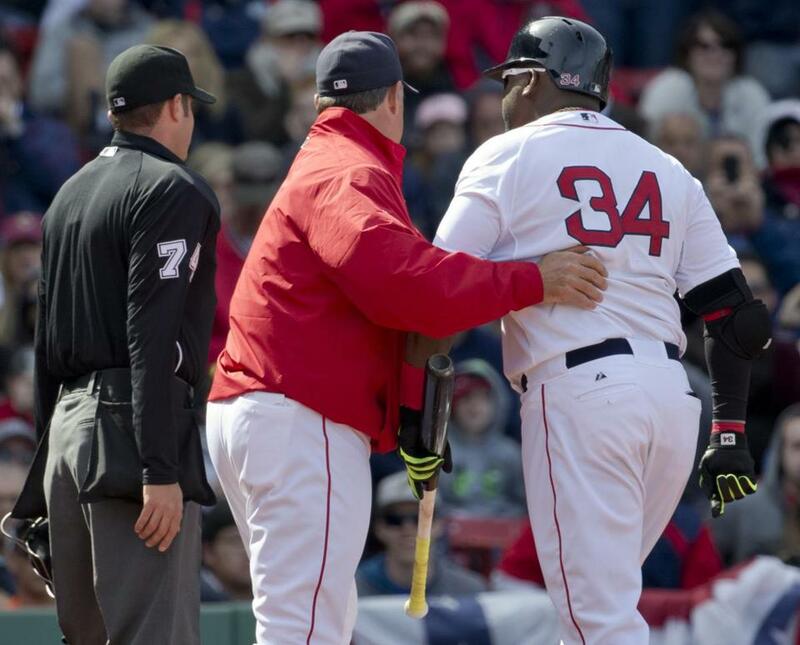 Red Sox manager John Farrell stepped in between David Ortiz and home plate umpire John Tumpane Sunday. ST. PETERSBURG, Fla. — Major League Baseball suspended David Ortiz for one game for “making contact” with an umpire during Sunday’s game against the Orioles. Ortiz immediately appealed the punishment and was in the lineup for Tuesday night’s 1-0 victory over the Rays. He also was fined an undisclosed amount. Ortiz said he did not recall making contact with umpire John Tumpane after he was ejected on Sunday. Ortiz disagreed with check-swing calls by third-base ump Meals. Ortiz had issues with the umpires over the course of the four-game series against Baltimore. In the eighth inning of Saturday’s game, Baltimore reliever Darren O’Day threw three consecutive pitches well out of the strike zone against Ortiz. The fourth pitch also was outside, based on MLB’s PITCHf/x data but was called a strike by umpire Jerry Meals. O’Day threw the fifth pitch even farther outside to walk Ortiz. In the first inning on Sunday, Ortiz checked his swing on a pitch from Baltimore’s Miguel Gonzalez that was called a strike by Meals from third base. Ortiz protested, then walked on the next pitch. In the fifth inning, Meals again called a strike on Ortiz on an appeal. This time Ortiz flung his bat on the plate and Tumpane ejected him a few seconds later. “That was kind of a weird situation, where I’m arguing with the third base umpire and the home plate umpire is the one kicking me out of the game. Whatever,” Ortiz said. Red Sox manager John Farrell was surprised by the suspension. “If there was any contact it was slight if at all and it wasn’t anything intentional. 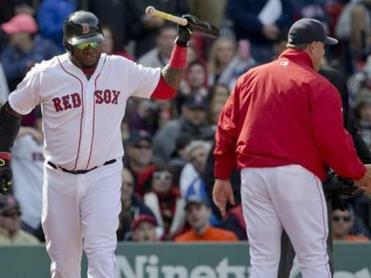 I know that,” said Farrell, who went on the field to push Ortiz away from Tumpane. “I know there was a lot of frustration on David’s part from Saturday’s game as well as the two check-swing calls that even in review of the film didn’t look like he broke the plane of the front edge of the plate. Farrell contacted MLB on Sunday night to give his version of the events. “I had a chance to talk to the league that night to share my view as well,” he said. “Still the suspension was handed down. Ortiz has a history of showing his displeasure with the umpires and has 11 ejections on his record, most of them related to arguing balls and strikes. This suspension is his second for unruly physical behavior. He was suspended for three games in 2004 for throwing bats onto the field after being ejected for arguing balls and strikes. Ortiz doesn’t believe he necessarily has a bad reputation with the umpires. Brock Holt started his fourth consecutive game, this time at shortstop after playing center field, second base, and third base. He made two highlight plays with strong throws to get Rene Rivera in the second inning and Asdrubal Cabrera in the seventh. Holt didn’t start the season with the Red Sox in 2014, in part because they weren’t sure he could handle shortstop. But the utility player has shown he has the arm strength. Farrell thinks Holt has gained arm strength. The player respectfully disagreed. Holt said it always has been there and people are just now taking note of it. Rick Porcello threw a long bullpen session at Tropicana Field four hours before Tuesday’s game. The righthander allowed eight runs on 12 hits over five innings against Baltimore on Sunday. Porcello said the focus was on his sinker and getting that pitch better located. He said the adjustment was to his arm slot and making sure he stayed on line and got the proper “whip” action with his arm. Porcello will face the Orioles again Saturday. But the adjustments are more on mechanics that facing any particular hitters again. Catcher Christian Vazquez, out for the season after undergoing Tommy John surgery earlier this month, will be in uniform for the series. Vazquez has been doing the early stages of his rehabilitation at the team facility in Fort Myers. He will rejoin the Sox full time later this season. Farrell said the process has been going well so far with Vazquez close to full range of motion. The Red Sox were 0 for 12 with runners in scoring position. They had not won with that many hitless at-bats with runners in scoring position since April 24, 2004 against the Yankees, 3-2 in 12 innings. They were 0 for 19 in that game . . . Dustin Pedroia is 1 for 16 with runners in scoring position, 0 for 2 on Tuesday . . . The Red Sox are 5-0 in series openers . . . Shane Victorino, with a ninth-inning double, had his first extra-base hit . . . The Sox are 10 for 10 on stolen bases. For several years, the Rays tried to annoy the Red Sox by not playing music during their portion of batting practice or playing oldies. But on Tuesday they played the same top 40 mix the home team had. The departure of Joe Maddon to the Cubs may have thawed the music cold war . . . Hanley Ramirez was back in the lineup after playing only two innings on Monday because of illness. “I was dizzy,” Ramirez said. “Not sure what it was.” Ramirez singled in his first at-bat then stole his first base of the season . . . Twelve Fenway Sports Group employees ran the Boston Marathon. Samantha Berenter, Marcell Bhangoo, Margel DiMaggio, Jess Dudek, Blair Kaneb, Kelsey Koswick, Daniel Mahoney, Carolyne McManama, Michael Melisi, and Abby Passeri ran for the Red Sox Foundation. Baily Brodeur and Liv Whitney ran for different charities.